In the thousands of new eBooks reading apps which have come out in the recent past, there are only a few who have made a mark. 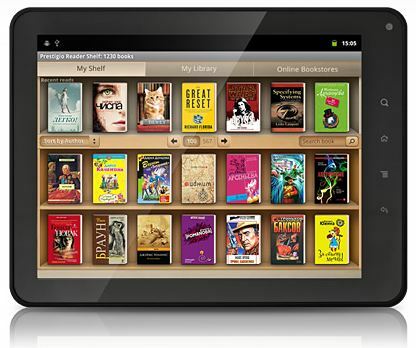 Prestigio eBook reader is one of the best-known apps in reading categories. The question is what does it offer you in addition to the regular features. Yes, you have the support for different languages. Naturally, you have the support for multiple formats as well. Of course, you can create, convert, and export new formats. Prestigio is everything that a decent eBook reader app in Android like Moon+, Helicon reader or any other can offer. But there must be something in it, that makes the app a highly admired one. You can see that critics hail it as the best. The question is why? When you initially look at the Prestigio app, you just see a plain interface which asks you permission to scan the device for books. Obviously, it brings all your books, eText materials, in formats PDF, ePub, Mobi, DjVu and more at one place. An all stop shop for Prestigio app comes as a handy feature. Now, this is nothing new at all. Amazon Kindle or Tolino reader does the same neatly as well. However, what makes the interface stand out is that the interface offers you options like scroll and lock, hide and categories, etc. The features make it smoother than most. You can practically smoothly move from one book to other with relative ease. The interface goes with the latest updates with Android and makes the use of Nougat version to work great with Prestigio app. The permissions and Bluetooth controls become incredibly easy to use in this app. Free reading books in over 25 languages ranging from world literature classics to the latest bestseller – download and immerse yourself in the world of fiction” is what the website for Prestigio states while explaining the app. Of course, the app becomes an easy alternative for every eBook reader that you may have on your device. The reason is simple, most of the features are included in this eBook reader, and the best part the app specifically comes in a small size. Now what stands out is the way in which you can download eBooks, free or otherwise, from its direct shop store, called the Plaza. Prestigio becomes a great alternative for you when you want to get your hands on something interesting quickly. So, you can download the books into the device and app, and start reading. Prestigio offers some unique features as well while bringing the same effect one from other successful apps. The app natively supports around 24 different languages without the need for any additional packs. Thus, you can open most of the eBooks, regional or not, instantly on the app. The app also saves your downloads, in a separate smaller size file. Thus, it is easier to load the books into different versions of Prestigio. Prestigio gives access to the expanded eBook marketplace eBooks Plaza offering more than 50,000 eBooks in 25 different languages, among which over 30,000 eBooks are free. In this regard, there’s always something for everybody. Thus, you can bring all the best of books from regional languages as well to the app. With different support to the right to left scripts, for especially Arabic and Urdu scriptures. Once, you select the languages you most use, you are set. Stand Out Features Prestigio App And How To Use Them? Audio support, Text to Speech and others. Most of these features are always available for different versions of Prestigio app. However, depending on the device features, OS version running and more, some of these features might be tweaked. All in all, the features will be available for every device in their way. Most of these features are available in the iOS version as well, as per the structure. The best part is that most of these bookmarks, features and settings are synced across the same ID. You just have to create and sync ID across devices and get reading from anywhere. With Prestigio installation, you get a pop-up window which asks you to create an account for accessing it. You can instantly create it, or in the latest version, log in using the Facebook or Google plus. Once you have logged in and verified your account, your Prestigio account is created. Simple as that. You can now use this ID across multiple devices like Mobiles, Tablets running Android, and Laptops in a desktop environment. The ID saves your preferences and settings in the cloud, and synchronises it across the devices, much like Kindle’s Whispersync. What’s more, you can also save your card details securely within your Account so that you can shop for Books, and eText materials easily. This feature is super useful when you want to access the marketplace. 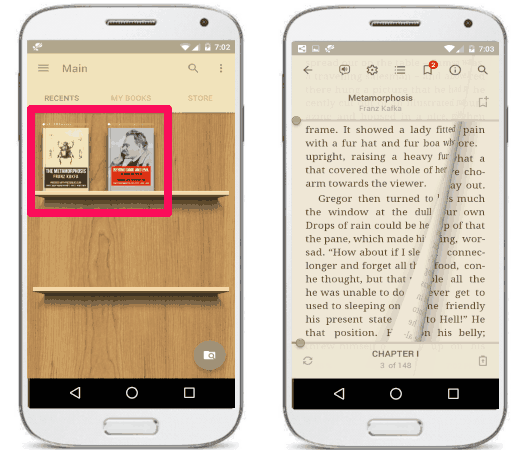 Thus, you can easily bring books into multiple devices with just one press of a button. Prestigio e-reader supports the popular text formats, EPUB, PDF, HTML, FB2, FB2.ZIP, RTF, TXT, EPUB3, Adobe DRM EPUB. So, this means that Prestigio app will give you all the wonderful things when it comes to lending support to all the formats. 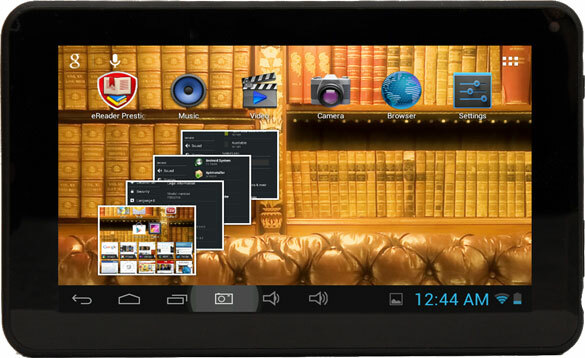 The better thing about it is that Prestigio lends the same features for almost all the formats. You can also edit, select, and export PDF files and Epub files. However, you can notice that the support for Mobi is not present. Naturally, Mobi is a native format for the Amazon Kindle. Having said that, the device also supports Mobi, but the functionality of the app comes under question here in. One another cool thing about Prestigio e-reader is that you can load your books from many various sources. You can upload books into this app, from not only SD Card, One Drive, Google Drive, or Dropbox. You can synchronise and attach all the online drives to the app, once by giving it the permission. Once set, the syncing will allow us to bring the best books as we want without wasting too much of the device space. Therefore, the app addresses a major issue we face with low-end phones which are mostly low on space. The other thing which makes Prestigio e-reader impressive to work is the easy category division which makes it all the easier to pick and read the books. Now as you go for the Layout tweaks, you can just make it work for landscape or portrait modes. Default somewhat defines the categories, but you also have the option to bring in more categories as per the need. Now, although more categories will help you group the books in order, we’d recommend that you have minimum groups as it ensures that the app runs as smoothly as possible. Also, according to the groups which are present in the app on the device, you can synchronise the categories on the online store. It makes for a great easy feature for easier ways to find interesting genre specific books. You can also load up your books into auto created user categories. It’s awful that so many commercial ebooks are sold with DRM included, and most of those would be incompatible with Prestigio if that original DRM remained intact. But anyone who’s bought a lot of DRM-free titles from vendors such as Baen or Smashwords will find Prestigio highly useful. To find a certain book, you don’t have to scroll through all the library. You can just search from the homepage to arrive at the back. That is the filter position which makes it easier to bring it up. The case changes as we move from functionality and move towards into customization factors. Thus, here we are looking at Themes which make your reading even more fun. Choose a theme that best suits your taste and mood, whether it is day or night, or you just want to try something new. Some of the themes you get are – Blue, Green, Dark, Light, Red. You can switch between the said themes depending on the books you are picking up. Of course, the app also allows you to create and save profiles which make saving all the easier. Don’t just read the books, hear them. You just must go for Audio support for the ePub e-books. In the eBooks, Audiobooks are the latest revolution to come out for reading enthusiasts. You see, most of the readers usually commute, and would love to keep hearing their eBooks while doing so. The books can also be tweaked to speak out the text. So yes, you don’t need a separate audio plugin for it. You can just enjoy the books easily. Have you ever had a situation where you are stuck in traffic or on a train and would like to continue reading your book, but it is impossible to read in the conditions? With the new Text to Speech functionality, you can listen to your books without ever having to look at the screen of your tablet or smartphone.